If you have not yet read Part 1: Are You Infuriated Yet?available free to all readers, please click here to read it first. I keep circling back to the financial markets because they are the chief signaling agent for most people. As long as the markets are doing okay, people’s attention wanders away from our predicaments and towards believing in the dominant "all is fine" narrative. But, with the crystal-clear connection we see between asset prices and central bank money printing, prices in today's “markets” are really a creation of monetary policy. As a result, the signals the markets send us increasingly have no bearing on actual reality. Here’s a good example: McDonalds' stock is hitting new high after new high. This is a function of both the ever-rising markets but also of the company's own internal accounting hocus-pocus. 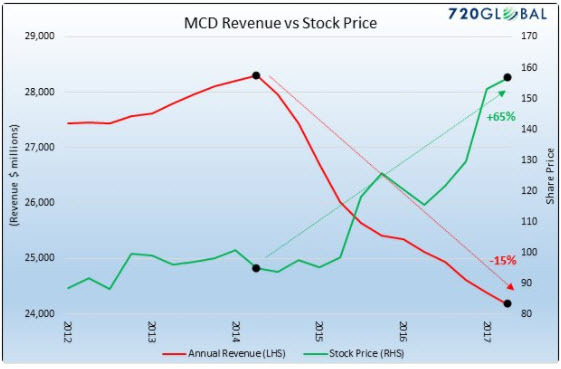 The red line tells us that MCD’s revenues are down a stunning 15% since 2014. The green line tells us that their stock price is UP an even more stunning 65% over the same time period. Meanwhile total debt of MCD’s has mushroomed from $14 billion to $29 billion, while total assets have shrunk. Yet MCD's stock price has risen handsomely.